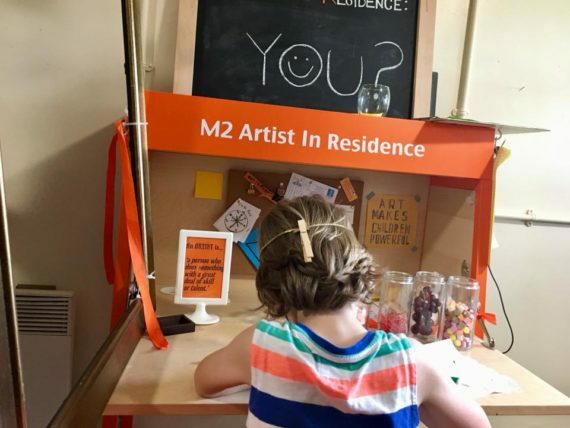 The latest season of M2AIR children’s art residencies concluded this weekend with a group show of work by all four residents that worked as part of this programme, with the assistance of sous-artists Megan Clark-Bagnall and Ali Brown. After an initial community day discussing potential themes, and during which applications were placed by many aspiring artists, permissions of leave from school were sought and the final four were selected. Lisha (8), Charlie (9) would share the first residency slot, and Todd (10), and Malakai (10) would occupy the second. Each artist spent two days at The Point, in the Bath suburb of Foxhill, working on ideas for their own individual exhibitions, before coming together for the group show at the end of the season.The final two days of the month long project gave the artists an opportunity to revisit the work they produced during their residency, making any necessary tweaks, and to consolidate their ideas around a central theme which would give the final group show its title, Perspective is Everything. On Friday afternoon, Malakai presented The Magic Post Box, which comprised three elements: a writing station, where viewers could participate in the work by writing down their achievements on an envelope; the post box itself, where participants could post their envelopes, and a story element, in which a squirrel named Keith climbed a mountain that turned out to be a journey of personal growth. Malakai told us of the visual link he had made between the design of the opening side of an envelope and a mountain with a cloud on top, and how that had inspired this project, which was accompanied by an audio recording of the artist himself giving some motivational words about how even small achievements can feel like mountains we’ve climbed. The Magic Post Box allows the viewer to take pride in even their smallest achievements. Saturday saw presentations from the three remaining artists. First, Lisha presented her Cake of Happiness. Visitors to the exhibition were invited to take part in a treasure hunt around a nearby park, which resulted in the discovery of six ingredients that make up a neighbourhood, from ‘a million sprinkles of sharing’ to ‘a spread of kindness everywhere’. Once collected, these ingredients were added to a mixing bowl and ‘baked for half an hour to rise together’. The top Lisha’s enormous cake featured a row of houses around the edge, and in the centre miniature models of Lisha and Charlie holding hands. Keith the squirrel popped up again, this time with the key to a door on the side of Lisha’s cake, revealing inside a real cake, from which visitors were invited to take a slice. Next up was Charlie, whose work centred around self-care, and provided us all with a reminder of how important it is to look after ourselves. Charlie, whose immersive work was titled Space in Space, built a tepee in the park which featured a worry shredder, stars on which visitors could write their wishes before hanging from the roof of the tepee, and a reading corner which included Charlie’s favourite books and an tranquil audio recording of a blackbird singing. Charlie’s presentation ended with an emotional ceremonial burial of everyone’s worries. Todd – whose name begins with T and ends with odd – was the final artist to present his work. His love of nature shone through as his installation piece, The Clay Station, invited people to make their own clay animals and add them to the forest, where a certain squirrel named Keith was also residing, before taking part in some tests Todd had set around his woodland diorama, and a word-link game that always seemed to come round to bodily functions and other unmentionable subject matter. At the end of it all, when the Ribena had been drunk dry, and hungry hands had scraped the bottom of the biscuit barrel, each artist was presented with their artistic license, and an artist’s statement that summed up their work and its motivations. Be it for the warmth of Lisha and Malakai’s work, of whom both celebrated the value of each other’s contributions and achievements, or Charlie’s one-person space (unless you’re brother and sister, in which case you can both go inside together) which drew on personal experiences as a reminder of how best to look after and value ourselves, or Todd’s work, which regarded nature itself as a source of happiness and inspiration, Perspective is Everything is without doubt the kind of exhibition that visitors will continue to think about and discuss long after everything is taken down and packed away. Disclosure: I spent some time working with M2AIR and the children mentioned in this review, in order to write their artist’s statements and to produce this review. It was a delight!